The Maxxis Bighorn atv tire is loved by many because of its wide range of capabilities. It is one of the best selling tires of all time. 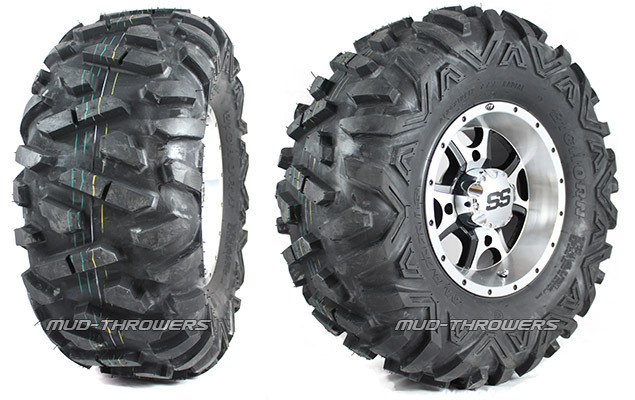 This tire is very rugged and suitable for all kinds of terrain including hard packed desert, dirt and rock. This tire has extra lugs on the shoulder to protect the sidewall and rim. The wrap-around tread also helps with mud-riding as well. They are an all around great tire and ride super smooth due to the radial construction and tread pattern. Maxxis Bighorns have a tread pattern and wide footprint that give these radials exceptional traction. Bighorn's shoulder advanced wrap around tread design protects the sidewall and wheel from damage. Big Horns have a 6 ply rating. They are very durable, with a long-lasting tread life, that will take the pounding all day long. The best part about the Maxxis Bighorn is the radial construction! With radial construction, recreational riders as well as ATV racers will immediately appreciate the ride quality and comfort. These tires will not only perform, but they ride great as well. The Maxxis Bighorn tire is one of the most popular in the industry today and copied by many other manufacturers. Maxxis is an industry leader first. We've seen machines get up to 5,000 miles out of these tires! Advanced tread design allows for a truly all terrain tire. Raised white lettering on one side, black on the other. Mount either way. * 29" tires do not have raised white lettering. 25" - 27" Maxxis Bighorns will inflate slightly larger than their stated sizes, usually about +1/4 to 1/2" tall. 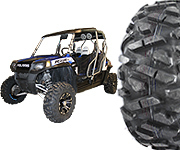 These tire have a maximum operation pressure of 18 psi, designed for higher load capacities of UTV's.